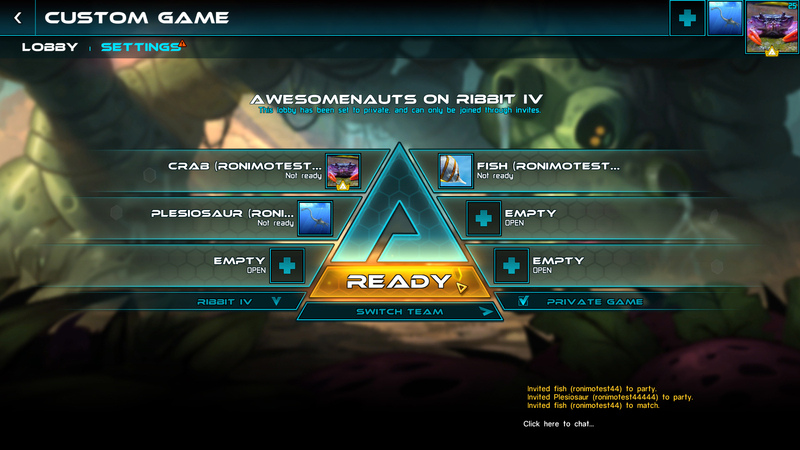 The Open Beta for Awesomenauts 3.3: Rise of Galactron is now available! If you haven’t tried it out yet, head over to our Official Forums to find out how you can access the Beta and let us know what you think of all the changes that we’ve been working on! Today we’ll be talking about the changes to the Custom Game Lobby. This is the fourth installment in our series of Spotlights, and you can find the other episodes by heading over here. Along with many other aspects of the game, the Custom Game lobby has been overhauled to work faster, be easier to use, and share more relevant information. 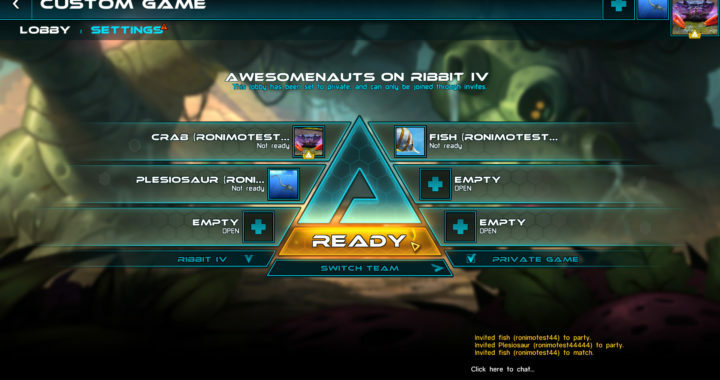 At the top of the screen you can now always see what the setting are for that game, and what map you’ll be playing on. 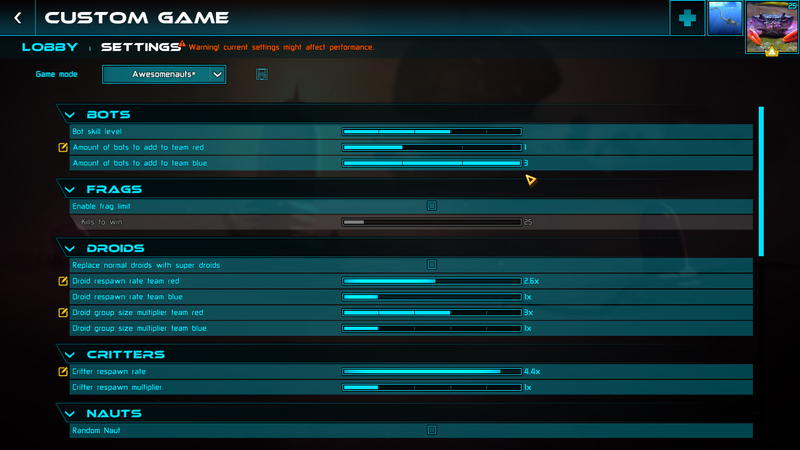 Figuring out which settings have been changed in a Custom game has also never been easier, as all settings that are not set to the default value for that particular game mode will be highlighted. On top of all this, the Settings screen has been overhauled completely, making it much easier to actually find the setting you’re looking for, and edit them in a much more comprehensive manner. With the overhaul of this menu, we’ve also added a feature that has been requested for a long time: the ability to ‘unready’! We all know that sometimes you’ve readied up only to have the match composition change at the last second, prompting players to want to switch teams or tweak some additional settings. Well worry no more, just hit unready and you’ll once again be able to do everything you want! The new Custom Game lobby screen is available in the Open Beta that’s available right now. As with any other aspect of the game, we’d love to hear from you! If you have any thoughts to share about this, or encounter any bugs with it, please let us know through the Bug / Feedback form accessible through the main menu in the Beta. If you want to discuss anything in particular, you can also head over to our Official Beta Forums. 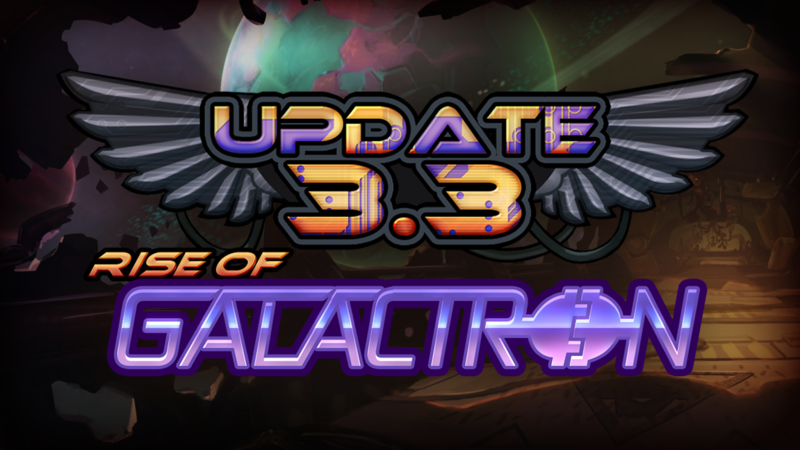 If you want to know about the changes coming in Awesomenauts 3.3: Rise of Galactron, check out the other Spotlights we’ve released on this topic so far or try out the Beta for yourself! The Open Beta will be closed on Monday July 25th and will be reopened when we’ve addressed the issues that came up during the tests!